If you're reading this, you're likely considering a diamond jewelry purchase for yourself or your beloved to celebrate one of life's greatest moments. Purchasing diamond jewelry online can be a great way to save money versus a purchase from a local jeweler or luxury retailer. 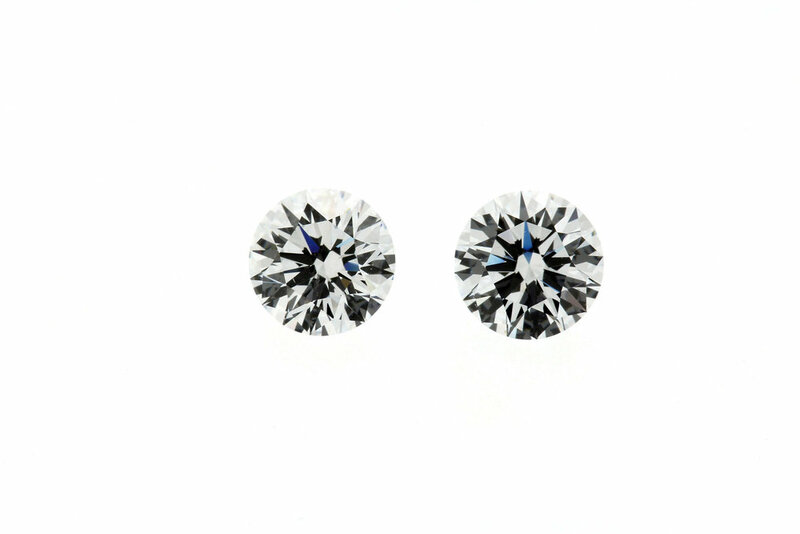 That being said, there are some potential drawbacks to purchasing online that can leave an unsuspecting purchaser with mediocre, lifeless diamonds that lack the fire, sparkle, and scintillation that makes high-quality diamonds so compelling. 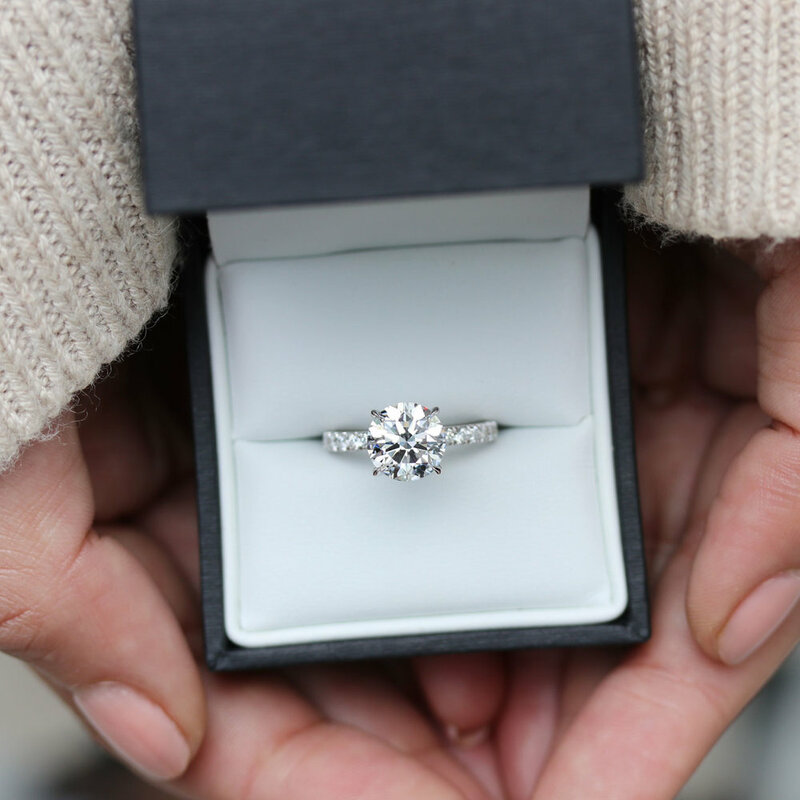 The bottom line is that if you find a diamond online that is significantly less expensive than comparable diamonds, it's probably too good to be true. It's most likely an unexceptional diamond that a re-seller has had in inventory for years. The Internet is where many wholesalers go to liquidate bad inventory, because, as we've heard them candidly say "online customers don't know any better." It's time someone had your back. Lower overhead - if you don't need foot traffic to your store, you can headquarter business operations outside of expensive retail real estate and have fewer retail employees who would otherwise stand idle during low traffic hours. Lower Insurance costs - Online retailers often do not allow clients to visit their location(s) and they don't have jewelry placed in vulnerable showcases. As such, their insurance costs are much lower than brick and mortar stores. In addition to their structural advantages, online jewelers own very few of the diamonds that they sell. Instead, they operate as a marketplace to leverage jewelers that need to liquidate inventory. The big eCommerce jewelers make it easy for any local jeweler to list their diamonds on the eCommerce website. The big eCommerce jeweler publicly lists the diamonds on their app/website. When a consumer purchases a diamond from the big eCommerce jeweler, the owner of the diamond ships the diamond to the big eCommerce jeweler’s warehouse. The diamond is quickly set in an off-the-shelf setting and then shipped to the client. There are a few drawbacks or risks that come with an online purchase of a diamond. Local jewelers use the big eCommerce websites to unload their oldest, ugliest inventory that they can't sell to any of their in-person customers. No employee of the website where you purchase the diamond has likely ever seen the diamond that you bought, only receiving the diamond *after* you have purchased it. This makes the entire purchase "sight unseen" and can leave an unsuspecting client with a low quality diamond. Many of the gold and platinum jewelry settings sold by big online retailers are bulk fabricated in countries with low cost of labor and lax environmental regulations. While fabricating jewelry settings in a country with cheap labor can save a client a lot of money, cheap labor and low quality often go hand in hand. Furthermore, jewelry production often requires the use a variety of acids, lead-based materials, cyanide, and other corrosive and toxic materials. In many countries, these material are not properly disposed and end up in the water supply. For example, the World Bank concludes that jewelry production is the #4 pollutant of water in Thailand, a large producer of low-cost jewelry. Diamonds are like pumpkins and Christmas trees: The good ones sell quickly, and the sad ones languish until the end of the season. However, unlike sad pumpkins and trees that are composted the end of the season, sad diamonds are... forever. Below are few of the common deficiencies or defects in diamonds you see online that are listed for significantly cheaper than other diamonds with similar 4 'C's (Cut, Color, Clarity, Carat Weight). Many diamonds glow blue when exposed to sunlight or ultraviolet light (aka blacklights). While this is very rare for lab-grown diamonds, approximately 25% to 35% of mined diamonds exhibit some degree of fluorescence. Thus, if you purchase a diamond that has fluorescence, it will change color under bright sunlight, and it will glow bright blue if you end up in a blacklight-lit environment such as a nightclub or Halloween party. According to Whiteflash.com: "In some cases, strong or very strong fluorescence can make a diamond appear cloudy, diminishing its transparency and eye appeal. Such diamonds are often described as having an oily, hazy or milky appearance." If you see a diamond listed online for a price that is too-good-to-be-true, check the fine print of the diamond for the fluorescence grade of the diamond. More likely than not, it will have strong fluorescence. There is a lot of material online that says that fluorescence is not that bad and beauty is in the eye of the beholder. We disagree and find those comments to be disingenuine comments from ‘experts’ that work at jewelers that need to sell their color-changing, glowing diamonds. Not all inclusions are created equal, even if the inclusions receive the exact same grade in a 4Cs report. Why? One inclusion may be in a location that substantively hampers the light performance of the diamond, whereas the other inclusion may be in a location that does not affect the brilliance of the diamond at all. In other words, the location of the inclusion can play a big part in the quality of the diamond more than the size or severity of the inclusion. At Ada Diamonds, our expert Diamond Concierge team spends hours each day closely studying the inclusion maps of each diamond as we curate a list of potential diamonds for a prospective client. These inclusion maps are created by the independent gemological laboratories when they 4Cs grade a diamond. Can the inclusion be covered by a prong during setting? Often the biggest and worst inclusion of a diamond is in the edge of the diamond where it can be covered by a gold or platinum prong when set by a goldsmith. Are the inclusion(s) in the table of the diamond? Imagine a diamond as a wine glass filled to the brim with liquid. The ‘table’ of the diamond is the surface of the liquid; it’s the top of the diamond that you look into every time you view the diamond. Now imagine a ‘black fly in your chardonnay’ and how undesirable it would make that glass of wine. The same thing happens with inclusions in the table of a diamond. That defect can block the sparkle and fire of the diamond, leaving part of the diamond dull and lifeless. Will the inclusion be reflected multiple times? Because of the way that light dances around a diamond, one single inclusion may appear up to 6 times. Similar to mirrors in a fun house, light bounces around a diamond in many different angles, so that one single black speck in a diamond may appear to the viewer as many black specks in the diamond. This multiple reflection problem is most common in step cut diamonds such as emerald cut diamonds and asscher cut diamonds. Will the inclusion increase the risk of chipping or breaking the diamond? Presumably, if you’re buying a diamond, you want that diamond to last forever. Thus, you do not want an inclusion that jeopardizes the structural integrity of the diamond, making it more likely to chip or fracture when the diamond is banged against a car door or side of a sink. At Ada, we avoid any diamond that has a fracture in the diamond (known as a ‘feather’) that extends to the edge of the diamond, thus weakening the crystal structure of the diamond. Some diamonds are simply not as clear and sparkly as others. This is not due to inclusions in the diamonds, but instead due to microscopic deficiencies or defects in the diamond that are not graded in the standard 4Cs report. The best way to describe cloudiness is to use water as an analogy: Pure water is crystal clear; however, most water has small particles of foreign material trapped in the liquid making it cloudy, milky, and difficult to see through. These particles are not ‘inclusions’ in the water, but are just enough microscopic material to give the water a cloudy, milky, or oily appearance. The same phenomenon happens with diamonds, where microscopic particles can be suspended in the diamond crystal make the diamond cloudy, milky, or oily in appearance. These lower purity diamonds often have a flat, lifeless appearance and poor light performance. Unfortunately, cloudiness is not mentioned in a standard 4Cs grading report, but is common in ‘too-good-to-be-true’ diamonds you see online. Other ways to spot the risk of cloudiness is if a certificate mentions strong or very strong fluorescence or if the diamond receives a fair or poor polish grading. When a gemological lab grades the color of a diamond, they are just looking at one undesirable color of the diamond: yellow. Thus if a diamond receives a K or worse color grade the diamond is a faint yellow color. Yellow is not the only undesirable color that occurs in diamonds. Diamonds can also have tinges or hues of gray, brown, green, or blue that make the diamond less beautiful than a colorless diamond. These unwanted tinges are not declared in a standard 4Cs grading report, and many ‘too-good-to-be-true’ diamonds you see online have these quality reducing colors present. Where do these colors come from? While a diamond's chemical composition is carbon, a variety of trace elements can be trapped in the diamond crystal. The most common defect is nitrogen; however, hydrogen, boron, silicon, and other elements have been observed in diamonds. These impurity elements affect the way a diamond absorbs light and produces the undesirable colors. Unlike deficiencies #1-4, which are due to defects in the diamond crystal, deficiency #5 is entirely related to the craftsmanship of the individual that cut the rough diamond into a diamond gemstone. In fact, Gemcutters regularly cut rough diamonds into ugly diamond gemstones on purpose. 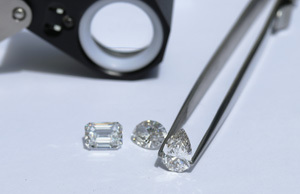 Gemcutters will intentionally make diamonds that leak light out of the bottom of the diamond. Thus, many diamonds have less scintillation and fire than they should have, with large dark spots in the diamonds where light is escaping the diamond. Why would these artists intentionally create ugly gemstones? It’s a simple matter of creating supply to meet demand. Consumers want to pass the threshold of round numbers: they want a 1 carat diamond, not a 0.96ct diamond. They want a 2.5 carat diamond, not a 2.37ct. Due to these spikes in demand, the industry-wide accepted MSRP of a 1.01 carat diamond (1.01ct Round G VS1) is $8,888 as of this writing, but the MSRP of a 0.99 carat diamond of similar quality (0.99ct Round G VS1) is only $6,633. So the diamond that weighs 2% more is worth $2,000 more! As a result, gemcutters are incentivized to cut a worse diamond that weighs more instead of a better diamond that sparkles more. As such, the Ada Concierge Team often recommend diamonds to our clients that are slightly below their minimum requested size, as a way to 'buy shy' of price jumps. This can empower our clients to receive better cut, better color, and better clarity within their budgets. 3Cs versus 4Cs: The only diamond shape that receives a 4Cs grading is a round brilliant diamond. Every single other shape of diamond only receives 3Cs during the grading process: Color, Clarity, and Carat weight. IE there is not a ‘Cut’ grade given to fancy shapes such as an oval, emerald, princess, and cushion cut diamond. You may still see a cut grade for a fancy shape on a grading report; this is in response to consumer confusion and demand expecting to see a cut grade across all shapes. This 'cut' grade is usually taken from the symmetry grading. When cutting a fancy shaped diamonds, gemcutters are able to cut worse quality diamonds because the Cut of those diamonds will not be graded. This freedom to cut for weight can leave low quality stones out there for unsuspecting clients. If you are in the market for any other shape than a round brilliant diamond, you need to exercise tremendous care in choosing a diamond that is well cut and voiding cuts that leave the diamond dark, flat, and subpar. If you see a fancy shaped diamond online for a price that is too-good-to-be-true, it’s probably an ugly diamond. We’re unabashed diamond snobs and refuse to sell you unexceptional diamonds. Virtually all online retailers will sell you any diamond you choose, no matter how ugly the diamond. We will not. That’s why we don’t list all of our available inventory for sale and instead custom tailor a list of potential diamonds for each of our clients. Our expert curation means that you will purchase a superlative diamond. We make every piece of jewelry to your exact specifications. You are as involved in the design process as you would like to be. Most of our clients go through 2-3 iterations of their design before we go into production. You will receive renderings and 3D models of your jewelry during the design process and we are extraordinary open to implementing your feedback to ensure that you or your loved one receives exactly what you want. We fabricate our jewelry in the United States to the highest standard. We pay a significant premium to make all of our jewelry in the United States where award winning artists make wearable art with via cutting edge manufacturing techniques, robust environmental standards, and fair labor practices. Our jewelry is certainly not the cheapest option on the internet, but like any product for sale, you get what you pay for. Our innovative business model saves you from paying for superfluous items. If you’re reading this, you probably don’t want significant portions of your purchase to be paying the rent of swanky showrooms in prime real-estate locations. You don’t want to be paying for the insurance to cover inventory that someone else will buy. You only want to pay for your diamonds, gold/platinum, and labor. Ada is able to make your dollar go further because we run such a lean, innovative business model. We treat you as a client, not a customer. Somewhere along the way, purchasing jewelry became a sterile, frustrating experience with pushy salespeople, limited selection, and little opportunity for customization. Ada is different. We will focus on you and your needs. We will learn about you and your beloved to ensure that you get the perfect piece of jewelry. We will steer you away from bad diamonds. We aspire to earn your business for life through our core commitments to quality, integrity, and artistry.